Communicate our purpose, as an organisation. Listen to, engage with and invest in our people. Provide the support and resources that our experts require to improve their processes. Ensure these processes are aligned with our ultimate goal of providing more value to our clients than our competitors. Partnered with the Lean Construction Institute (LCI) to sponsor and organise a seminar entitled ‘Lean as Ideology and The Ability to Change’. Trained a significant percentage of staff to white, green and black belt level of lean capability. Partnered with a leading international consultant and engaged in many process improvements. 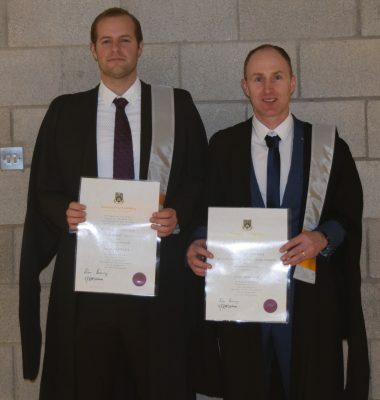 Johnny Crowley (Continuous Improvement Manager) and Leo Doherty (Project Manager) who graduated with a Specialist Diploma in Quality Management Lean Systems from the University of Limerick recently. With the help of our experienced team and their close adherence to lean philosophy, you can rest assured that your project will be completed on time, on budget and to your exact specifications. To see for yourself how the implementation of lean engineering can be indispensable for your business, talk to us today.